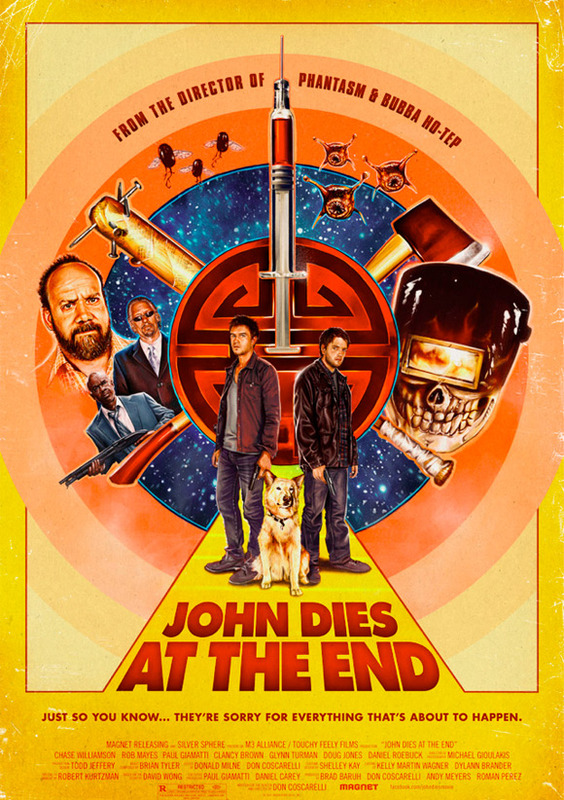 JOHN DIES AT THE END is about a couple of slacker friends – John (Rob Mayes) and Dave (Chase Williamson) – who take a weird new street drug called “soy sauce” that gives them various supernatural abilities. As John explains to reporter Arnie (Paul Giamatti) via flashback, they then reluctantly used these new powers to fight hideous extradimensional abominations like a monster made out of meat, which isn't even the weirdest thing in the movie. Eventually they team up with a one armed girl named Amy (Fabianne Therese), her dog, and occult superstar Marconi (Clancy Brown) to face a threat that endangers the whole world. Not surprisingly Arnie is a bit skeptical, as are we, but Dave promises he has proof. No two ways about it, JOHN DIES AT THE END is a pretty weird movie. Not that it should come as any surprise, seeing as it's based on a pretty weird book and directed by Don Coscarelli, the man responsible for the PHANTASM series, THE BEASTMASTER, and BUBBA HO-TOP. On Coscarelli's own scale, I'd put this somewhere in between PHANTASM and BUBBA. It has some of the surrealism and anything goes nuttiness of the former, but also the whole unlikely hero thing that BUBBA had going on. There are also echoes of such eighties flicks as THE HIDDEN and NIGHT OF THE CREEPS (not to mention a touch of stuff like THE ADVENTURES OF BUCKAROO BANZAI, REPO MAN, and BIG TROUBLE IN LITTLE CHINA). The film goes for more laughs than scares, but still takes its plot seriously enough to create an appropriate level of tension and suspense. The fact that the actors all play it straight helps a lot, too. Like all of Coscarelli's films, rough edges occasionally show. Nothing outright shoddy, just not the sort of super slick special effects and production values you'd expect from a major Hollywood production. As far as low budget independent fare goes, though, it's about as good as it gets. Any shortcomings are more than made up for by the originality and passion that oozes from every frame of this film. It's funny, clever, and disgusting in the sort of way that only indie horror films like RE-ANIMATOR, DEAD-ALIVE, EVIL DEAD 2, and of course Mr. Coscarelli's own past body of work can be. If a big studio had made this, it might have looked slicker, but it wouldn't have been have been half as fun and original. 3 out of 4 stars.